After a bruising week of distractions and disappointments at home and abroad, President Donald Trump turned to performance art and a campaign-style speech at the annual Conservative Political Action Conference that tried to recast setbacks for his White House and rally conservatives ahead of his bid to be re-elected in 2020. "You know I'm totally off script right now. And this is how I got elected, by being off script. It's true. And if we don't go off script, our country is in big trouble, folks because we have to get it back," Trump said. In his first public appearance since his second summit with North Korea’s Kim Jong Un, the president stepped out on stage and gave the American flag a bear hug, setting off an expletive-laden, off-script campaign-style speech on red meat topics like the Mueller report, tariffs, Hillary Clinton’s emails, tax reform, healthcare and even touched on Tivo and inauguration crowd sizes. He affected a mock southern accent to ridicule his former attorney general Jeff Sessions to some howls of delight from the crowd. The president left Vietnam this week early, without any agreement on denuclearization or sanctions. He also saw headlines from home that his former lawyer and fixer Michael Cohen painted him on the national stage as a crook. 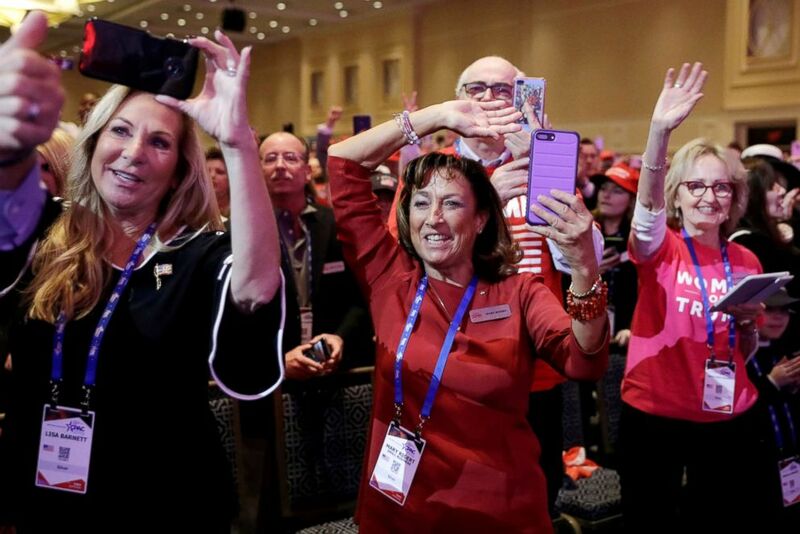 But on the CPAC stage, the president embraced the “love in the room” that sometimes broke into cheers and chants of support. Flailing his arms and changing his voice, the president re-enacted his call for Russia to hack into Hillary Clinton’s emails and claimed he was only being sarcastic and was misunderstood by the media. The president also revealed that he told first lady Melania Trump that he fired former FBI director James Comey because he was doing a bad job, and not because of Russia, as he has said before. “When I fired Comey, I said you know, first lady, I said Melania, 'I'm doing something today. I’m doing it because it really has to be done. He is bad. He's a bad, bad, he is a bad bad guy, it's been proven that with all of the emails,'” Trump said. People cheer as President Donald Trump speaks at the Conservative Political Action Conference (CPAC) annual meeting at National Harbor near Washington, D.C., March 2, 2019. The crowd roared as the president mimicked different politicians and re-enacted events, including the president’s Christmas in Washington during the government shut down. He then pivoted to talking about flying to Iraq in the middle of the night to meet with troops on the ground. "I'm in the White House and I was lonely. And I said let's go to Iraq!" said Trump. “By the way -- as of probably today or tomorrow -- we will actually have 100 percent of the caliphate in Syria, 100 percent,” Trump added, a claim he has made before. He also knocked the "Green New Deal" unveiled by Democrats Rep. Alexandria Ocasio-Cortez and Sen. Ed Markey. He later described the progressive platform as “a high school term paper written by a poor student." It was the Trump's fifth visit to CPAC and his third time speaking at the convention, which attracts big-name Republican lawmakers and conservative commentators. On Friday, Vice President Mike Pence touted the Trump administration's tax cut bill, anti-abortion stance, and slammed the Democrats' "New Green Deal" and push for Medicare for All. Looking ahead to 2020, the president said he regretted giving Democrat Sen. Elizabeth Warren the nickname “Pocahontas” so early. "I'm going to regret this speech. I should have delivered this one year from now," Trump said. "I don't want to knock out all of the good stuff and end up with somebody that's actually got talent. That would be bad." The president revealed he will be introducing an executive order calling on colleges to protect free speech or risk losing federal funding.